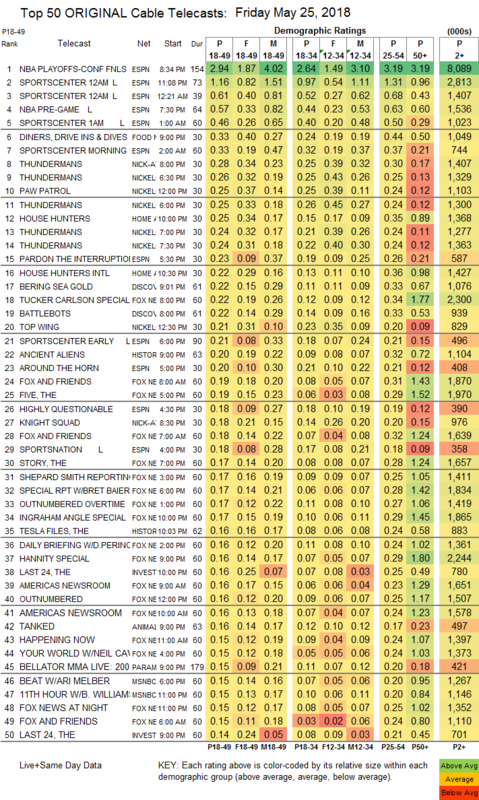 NETWORK FINALS: DATELINE and MY LAST DAYS each lost 0.1 in final numbers. CABLE HIGHLIGHTS: ESPN’s NBA PLAYOFFS game dominated the night at 2.94. Food Network’s DINERS, DRIVE-INS & DIVES was the highest-rated show not related to basketball at 0.33. A quintet of THUNDERMANS episodes crowded the Top 10 (technically, 4 were on Nickelodeon and 1 on Nick At Nite) at 0.28/0.26/0.25/0.24/0.24. Nickelodeon was also in the Top 10 with PAW PATROL at 0.25, and in the Top 20 with TOP WING at 0.21. HGTV’s HOUSE HUNTERS gained 0.02 to 0.25, and HOUSE HUNTERS INTL was down 0.03 to 0.22. 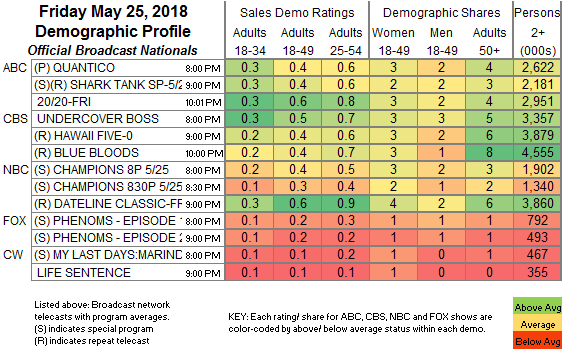 On Discovery, BERING SEA GOLD dropped 0.06 to 0.22, and BATTLEBOTS was down 0.04 to 0.22. History’s ANCIENT ALIENS lost 0.04 to 0.20, and TESLA FILES was down 0.03 to 0.16. ID’s THE LAST 24 was at 0.16/0.14. Paramount’s BELLATOR LIVE was at 0.15. HBO’s WYATT CENAC’S PROBLEM AREAS fell 0.03 to 0.07.